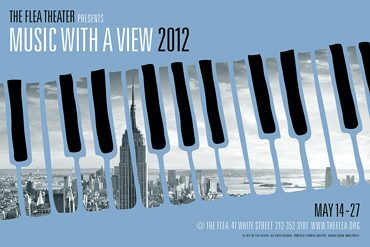 The Flea Theater welcomes back its trendy FREEperformance festival: Music with a View 2012. Starting May 14th and running for two weeks, The Flea will be home to 27 of the most innovative composers from around the world. This festival provides a rare playground for exceptional artists to develop and present exciting new work. Each evening of performance is followed by an open discussion between the composers and audience, moderated by a luminary of the music scene. Music With A View was developed in response to the need for emerging and established composers to have place to fine-tune and present their works-in-progress. Each Music With A View event features the works of 2-3 emerging and/or mid-career composers and each performance will be followed by an open discussion between the artists and the audience, moderated by musician Kathleen Supové and other leaders in the field of music. Admission is FREE. Kathleen Supové is one of America’s most acclaimed and versatile contemporary music pianists, known for continually redefining what a pianist/keyboardist/performance artist is, in today’s world. Ms. Supové annually presents a series of solo concerts entitled THE EXPLODING PIANO. In this series, she has performed and premiered works by such established composers as Louis Andriessen, Terry Riley, Frederic Rzewski, Alvin Curran, Neil Rolnick, and Morton Subotnick, as well as emerging composers such as Missy Mazzoli, Randall Woolf, Anna Clyne, Lainie Fefferman, Mohammed Fairouz, Nick Didkovsky, Carolyn Yarnell, and Bubblyfish, just to name a few. She is also involved in commissioning a repertoire of pieces for piano, electronics, and video. This past December, she premiered ELECTRICSHEEP by Marc Mellits for solo piano and LEMUR robots. Another recent ongoing project is DIGITALDEBUSSY, working with a variety of composers including Joan La Barbara, Annie Gosfield, Matt Marks, Gene Pritsker, techno artist Jeff Mills, Elan Vytal (aka DJ Scientific), Marita Bolles, Eric km Clark, and others. Ms. Supové is a Yamaha Artist. Her latest solo CD is THE EXPLODING PIANO, on the Major Who label. She has appeared with The Lincoln Center Festival, Other Minds Festival, The Philip Glass Ensemble, Bang On a Can Marathon, Music at the Anthology, Composers’ Collaborative, Inc., and at many other venues, ranging from concert halls to theatrical spaces to clubs such as Le Poisson Rouge. For more info, visit www.supove.com or follow www.facebook.com/supove.